Sharrow on North Figuera St. approaching intersection with San Fernando Rd. Northeast L.A. based bicyclists may have noticed the sharrows that have appeared in the vicinity of the on-going Riverside Dr. bridge construction. 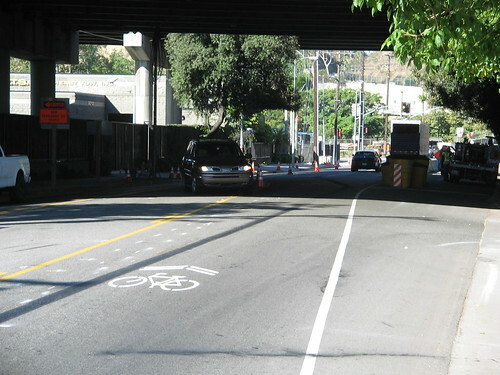 The sharrows help accommodate the particularly high volume of bicyclists that traverse the Class III route, now a construction zone, to access the L.A. River Bike Path or travel towards Downtown. The sharrows were installed Friday, June 22nd, as the result of a temporary work zone construction plan and in coordination with Council-member Reyes’ office. Jill Sourial, Environmental Projects Manager for Council District 1, explains that the district office received several calls from constituents concerned about the need to maintain Riverside Dr. Bridge as a key bicycle route even during construction. Staff from the LADOT Bike Program met with staff from the LADOT Bridge Design group to work through the best alternatives for bicyclists. Sharrows and accompanying signage were then paid for through the bridge replacement project’s budget. First location to receive “Bicyclists May Use Full Lane” signage in L.A. The sharrows were installed alongside newly approved (by the California MUTCD) “Bicyclists May Use Full Lane” signs. Our group recently received an order of these signs and those accompanying the sharrows along the Riverside Dr. Bridge construction site were an ideal place to try them out first. While these signs have been erected as a temporary measure, the city also will soon be complimenting existing sharrowed routes throughout the city with the same “Bicyclists May Use Full Lane” signs. Sharrows and signage will also soon appear on Avenue 19 due to ongoing construction on that street as well. Going forward, the city hopes to better coordinate necessary departments to accommodate cyclists at future construction sites, especially where existing bicycle facilities are affected. After construction is done, will bikes not be allowed to use the full lane anymore? This is wonderful. I am not a fan of bike lanes, but both the sharrows and the bikes-may-use-full-lane sign are very helpful, especially during the construction. This is such a depressingly awful freeway-esque project – in its excessive-lane-width design, tearing down a historic bridge, and in the unsafe pedestrian-hostile and bike-hostile ways that its construction has gotten underway. What a sad car-centric evil (I don’t use that word all that often) project this is… no matter how much lipstick the city smears on it, it’s still a pig. When will we get to see some of the engineering sketches or renderings of this bridge project? I live and work in this area and my calls to the BoE were never returned. Anyone in the LADOT know the story? From what i have heard, the bike lanes will dump people off at Avenue 19 – which is sort of a shame because it skips over the heart of the Figueroa/Avenue 26 business district and even avoids the minor commercially zoned area by Humboldt and San Fernando. The LA River bike path needs to be about more than bikes. If we’re spending this kind of money, that bike access needs to improve property values and retail spending in the area. Otherwise, how will the bike paths pay for themselves both politically and financially?